Rally Cycling dominated stage one of the Tour of the Gila with Matteo Dal-Cin powering away on a small climb with two kilometers remaining to win the stage by six seconds. Behind Dal-Cin, Rally Cycling stacked the top ten with Colin Joyce finishing in third, Rob Britton fourth, Adam De Vos fifth, Evan Huffman seventh and Sepp Kuss eighth. The win earns Dal-Cin the leader’s red jersey as well as the green jersey as the leader of the points competition. The team also sits atop the Team Classification. 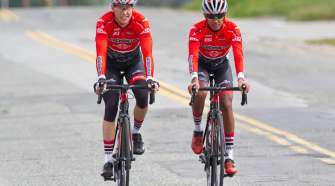 Stage one of the Tour of the Gila had a much different feel this year as the iconic finishing climb to Mogollon was cut due to flood-damaged roads. The revised route required a change in strategy and provided an opportunity for breakaways and sprinters. 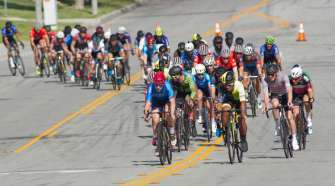 A breakaway of three riders seized the chance and set the pace for most of the day before being reeled in by the efforts of Danny Pate and Eric Young. As the finish line approached, Dal-Cin launched his stinging attack at the 2k to go marker. 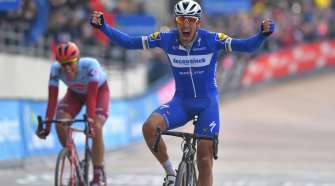 Despite the peloton giving frantic chase, Dal-Cin was able to raise his arms in victory. Rally Cycling will look to defend the overall lead the rest of the week with the major general classification battles likely to come in the stage three time trial and Sunday’s Gila Monster Road Race. In the women’s race, Sara Bergen finished in third, continuing her long streak of podium placings that stretches all the way back to the Tucson Bicycle Classic. In addition to a podium finish, stage one of the Tour of the Gila saw the return of Allison Beveridge to road racing for the first time in two years after a difficult post-Olympics surgery. Beveridge had an immediate impact on the peloton, positioning the team well before the crucial moments of the race and assisting Amy Benner, Caitlin Laroche and Emma White in marshaling Bergen to the front during the closing kilometers. The women of Rally Cycling will remain on the hunt for stage wins and to propel Bergen onto the top step of the final podium. Stage two will be the traditional out and back loop beginning and ending in Ft. Bayard. The stage features some early climbing over the category 1 Pinos Altos ascent before dropping down to level terrain mid-stage and finally stair-stepping back to the finish. Young who served as a workhorse for the team today may get an opportunity at the finish, where he’s won twice before.